Blessix Face Moisturizing Micellar Water removes makeup, cleanses, moisturizes, nourishes, elasticizes and smoothes skin. It contains sodium hyaluronate which prevents transepidermal water loss. It’s an active ingredient with moisturizing, protective and anti-ageing properties. Pro-vitamin B5 acts as antioxidant, reduces harmful effects of free radicals and improves blood circulation. The liquid contains vitamins PP, A, E, F and lactic acid which strongly moisturizes skin. 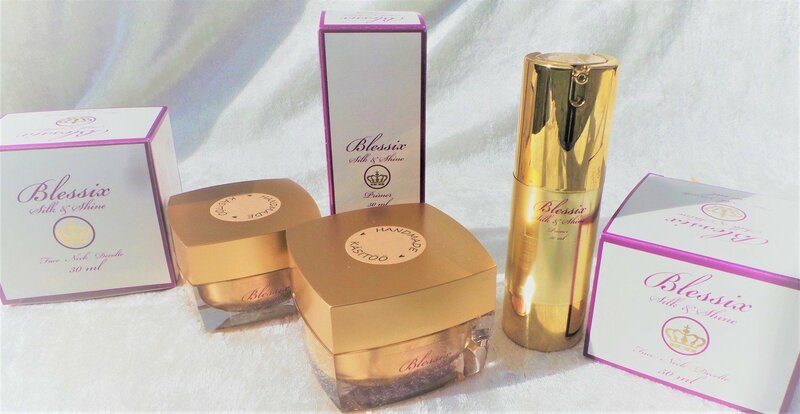 As well as real 24K gold this luxurious face cream is made with nourishing seed oils, antioxidant-rich green tea, shea butter, rice and silk peptides. The cream is easily absorbed and noticeably improves overall complexion, being well suited for both dry and normal skin. It has a cleansing and soothing effect, leaving your skin smooth and radiant. Rice powder works as a primer and helps keep your makeup at its best for longer. Its microcrystalline structure leaves the skin velvety smooth. With its serum-like effect this cream is especially suitable and convenient for people with a busy lifestyle. Instantly refreshes tired eyes and restores youthful vitality. Infused with sea collagen, aloe vera, cucumber and sea buckthorn extracts, this lightweight fast-absorbing gel soothes and moisturises delicate skin around the eyes. The added gold gives a light reflecting effect and your eye area looks lifted and firmer. 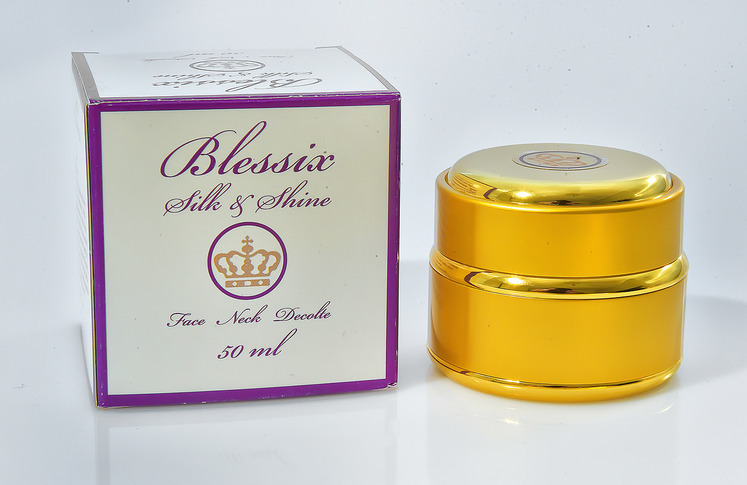 The Blessix Silk Cream is rich in genuine silk proteins making this cream particularly effective in improving skin texture and reducing pigmentation, leaving the skin with a radiant youthful glow. Containing 18 amino acids this cream helps to restore balance to pH levels and is especially suitable for those with skin problems including acne. Apply a small amount of the cream with a spatula or brush. Initially, you may feel gentle flushing of the skin while a few minutes after absorption your skin will feel wonderfully silky soft. This Gold Cream leaves the skin with a beautiful glow whilst the antioxidant green tea fights free radicals and natural jasmine improves skin elasticity. Designed as a caring day cream, which gives the skin a gentle velvety glow, makes the skin super-soft and improves skin tone. The nourishing composition leaves you with a beautiful complexion and radiant skin. Suitable for dry and normal skin types. Enjoy this excellent set of gold creams at a special price when bought together in this fantastic offer! Suitable for normal, combination and oily skin. The Gold Cream Primer has a serum-like effect and leaves the skin with a radiant glow. It can be used instead of foundation or as a base for make-up. The Primer and Day Cream are an ideal pairing for oily skin having a lightweight composition that gives a fresh complexion and radiant looking skin. These creams are made of all natural and organic ingredients and will be absorbed into deeper layers of the skin. Ideal gift for yourself or a loved one! Especially developed for oily skin, the Silk & Shine Gold Cream contains skin-repairing and anti-inflammatory aloe vera extract and geranium, while the gold content leaves the skin with a beautiful glow. Designed as a caring day cream, which gives the skin a gentle velvety glow, makes the skin super-soft and improves skin tone. The lightweight composition leaves you with a beautiful complexion and radiant skin. Suitable for oily and combination skin types.